Hanseatic Aviation Solutions GmbH offers innovative Products and Services based on our extensive experience in the aviation industry. Our Unmanned Aerial Systems offer proven concepts, following hundreds of successful flight hours and many missions. As a development and manufacturing company we can provide bespoke tailored systems unique to your application, as well as small series production. We are pleased to announce that our new fixed-wing drone S360Mk.II is almost “ready for take off”. Based on the proven design of S360 the new S360Mk.II is characterized by various optimizations. The most important innovations are: More space in the fuselage for sensors and/or fuel, better access to the integrated sub systems, capable to fly in rain and dusty environments. The S360Mk.II will be equipped optional with ADS-B transponder and onboard power generator. The multiple payload concept, the outstanding flight performance from S360 and the capability for customization are preserved. The first three systems are in final assembly and will be delivered to customer or used in our running projects. ​25/01/2019, Hamburg-Bremen: New web page of the project REALISE is launched. Find more exciting information about the project here. ​19-20/06/2018, Berlin: Hanseatic Aviation Solutions with LARUS project on BMBF-Innovationforum "Zvile Sicherheit"
Hanseatic Aviation Solutions exhibits on the forum for "civil security". The LARUS "Early Demonstrator" has been presented during this 2-day conference with round about 600 participating experts. We thank for the interesting talks during the event at our booth. 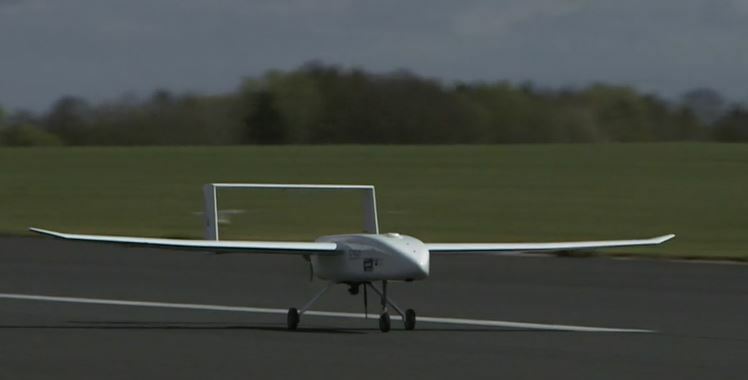 The S360 is equipped with new features and payloads to perform a flight test for the R&D project LARUS. After the successful flight on the 19th of April 2018 more flights will follow to validate the concept as a SAR drone for maritime applications. See below a video of the flight (3:37 min). The project partners are working on future business cases. In the case of major catastrophes, such as forest fires, the S360 is used in fleet operations and enables around-the-clock operation. The mobile take-off and landing system opens up inaccessible areas and shows the advantages of fixed-wing drones. With the project REALISE, the ground-based landing gear system GroLaS enters the first step of the realization phase. REALISE stands for "Runway Independent Automatic Launch and Landing System" and is pursuing the construction of a test facility for unmanned aerial vehicles of market relevance in the next three years together with several partners. HANSEATIC AVIATION SOLUTIONS is also involved. As part of the project, the systems S180Mk.2 and S360 will be prepared for GroLaS and serve as experimental vehicles. If the project progresses positively, it will be possible to increase the range for the UAV S360 enormously with the use of GroLaS and, in particular, to carry sensitive payloads. Further partners are Nordwig, RWTH Aachen University, TUHH, Thelsys, DLR, TÜV Nord and Airbus DS. The project is co-financed by the Federal Ministry of Education and Research. We look forward to a constructive cooperation and the joint project success! 11/04/2017, Rotenburg/Wuemme: Hanseatic Aviation Solutions performs test and calibration flight for company "The Spinning Bird", Paris. Equipped with a PhaseOne iXU150 camera the S360 shows even during rough weather conditions it's high flight performance. The test flight is a proof of concept for wildlife monitoring and detection. Find a video about the S360 here.